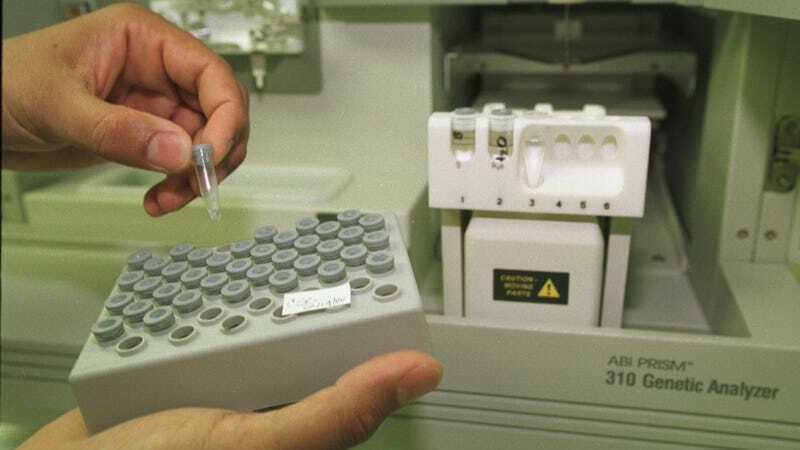 For years, DNA testing conspiracy theorists have been saying those at-home DNA testing kits that help people figure out their ancestry and find relatives will also one day be stockpiled by the government to keep tabs on us, and it looks like that day is now. According to Buzzfeed News, Family Tree DNA is letting the FBI peruse its database of 1,021,774 records in order to potentially catch killers, rapists, and identify remains. “Without realizing it, [Family Tree DNA founder and CEO Bennett Greenspan] had inadvertently created a platform that, nearly two decades later, would help law enforcement agencies solve violent crimes faster than ever,” FamilyTree said in a statement to Buzzfeed. Here’s how it works right now: Family Tree doesn’t have a contract with the FBI, but the firm will test DNA samples in its private lab and upload those profiles to its database. Buzzfeed reports that the company has worked with the FBI on fewer than 10 cases since fall. Family Tree is the first of these private DNA testing firms, which also include 23andMe or Ancestry.com, to work directly with law enforcement to solve cases. However, right now their access is limited to databases where users have voluntarily given their results, though those users ostensibly uploaded their information to find relatives and not to give their records to law enforcement. One of the most notable uses of DNA databases were in the hunt for the Golden State Killer, when Family Tree DNA was served with a federal subpoena to reveal the identity of an account sharing DNA with that found at a crime scene. Though the subpoena didn’t result in catching the GSK, a partial match found in a different database did. Family Tree was recently named the best kit for “research and privacy” by U.S. News. They still promise not to sell your DNA info to corporations, but we’ll see.